We are a leading Manufacturer of redler chain conveyor, loading chain conveyors, apron chain conveyor, assembling chain conveyor, stainless steel chain conveyors and chain conveyor from Coimbatore, India. 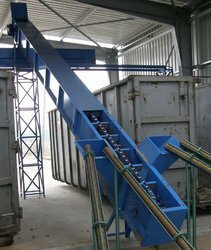 Our company is highly esteemed in offering RedlerChain Conveyor to the clients. 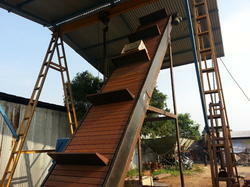 Chain Conveyor is dispatched in the market after full inspection by the team of experts. The offered range is manufactured at well-developed production unit by using finest quality raw material and advanced technology under the strict industry laid norms. This product can be customized as per the specifications of valuable clients. The offered range is easy to fix and has long lasting life. This product is widely demanded in the market for unmatchable and superb attributes. We are a renowned name to offer an assortment of Loading Chain Conveyors, which is used for transporting the heavy unit loads. These are extensively used for material movement in various industries. These sturdy products are known for their robust construction, corrosion resistance, dimensional accuracy and durable nature. We are the leading manufacturer and supplier of Loading Chain Conveyors in Tamilnadu, Kerala, Coimbatore, Tirupur, Karur, Salem, Chennai etc. Our company is highly esteemed in offering Apron Chain Conveyor to the clients. Chain Conveyor is dispatched in the market after full inspection by a team of experts. The offered range is manufactured at well-developed production unit by using finest quality raw material and advanced technology under the strict industry laid norms. This product can be customized as per the specifications of valuable clients. The offered range is easy to fix and has long lasting life. This product is widely demanded in the market for unmatchable and superb attributes. We are a trusted name in manufacturing an array of Assembling Chain Conveyor employed in modern material handling systems. Our conveyor is known to sustain heavy loads for long distance and maintain speed and impact. Our products are easy to install and are used to carry materials to long distances with an efficient output. We are the leading manufacturer and supplier of Assembling Chain Conveyor in Tamilnadu, Kerala, Coimbatore, Tirupur, Karur, Salem, Chennai etc. We are one of the leading manufacturers of high-end Stainless Steel Chain Conveyors. Robust in construction, these conveyors are highly durable. These conveyors form an integral part of the production line of various industries. We are have gained worldwide recognition for manumitting this product. The chain blades are designed to suit the configuration of conveyors and the material handled. Note: We are the leading manufacturer and supplier of Stainless Steel Chain Conveyors in Tamilnadu, Kerala, Coimbatore, Tirupur, Karur, Salem, Chennai etc. Our company is highly esteemed in offering Chain Conveyor to the clients. Chain Conveyor is dispatched in the market after full inspection by a team of experts. The offered range is manufactured at well-developed production unit by using finest quality raw material and advanced technology under the strict industry laid norms. This product can be customized as per the specifications of valuable clients. The offered range is easy to fix and has long lasting life. This product is widely demanded in the market for unmatchable and superb attributes.